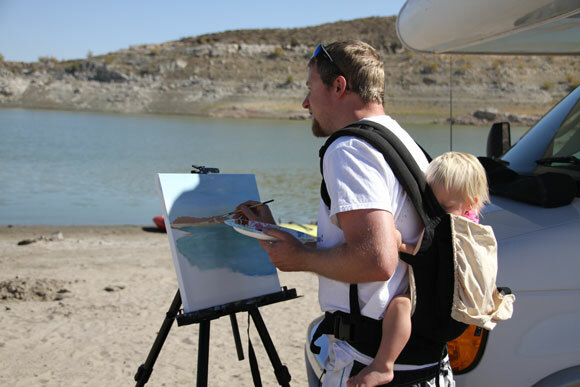 We were camping in our RV on the shore of Elephant Butte Lake in New Mexico, so I painted these plein air landscapes one morning, with our youngest child on my back in a baby carrier. The sky was nearly cloudless, which usually doesn’t make for the best landscapes, but there was something beautiful and serene about it. I took nearly a couple hours to paint the first one, carefully trying to capture the colors. I painted the second one in about 10 minutes. I already had a good feel for the colors and decided to go for a more impressionistic look. I felt like I was supposed to give away the paintings at a gas station where we had bought some groceries. 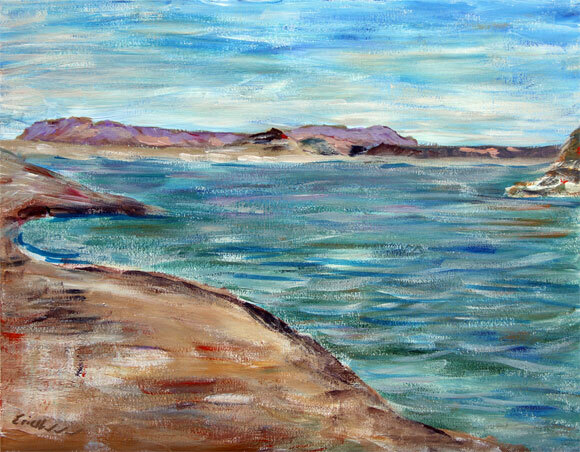 I figured the paintings would be more meaningful to someone who actually lived in Elephant Butte. I offered them to the young woman at the counter, and she said the paintings were beautiful. She really liked the first one, so I told her to take home that one for herself and keep the other one for the store. I said I lived in Colorado. She told me that her brother loved Colorado, and that perhaps he was wandering around in Colorado right now. I asked her if she had lost touch with her brother, and she said, “no, we lost him”. I asked what happened, and she told me about how he was murdered 5 months earlier. It was a sad and gruesome story. I said there’s probably not many people to talk to around here, are there? She said no, there wasn’t, and her parents didn’t want to talk about it at all. She had written a letter to her brother just the day before, as a way of working through the pain. I had the opportunity to pray with her, and tell her that God was with her. 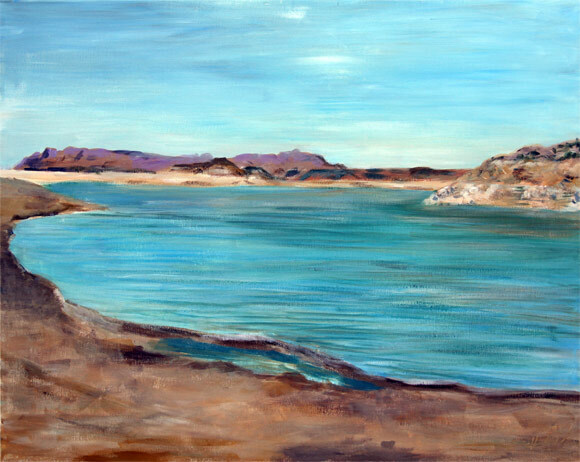 I explained that the painting was a reminder of God’s peace. Praise God that he used the painting to open the door for ministry. I pray that she receives continued healing and hope.